sandals I was so proud of. out to each child in the road a sixpence. red dress for the occasion. I was so surprised to see her leading the line in the conga. cheerily in a chair belonging to one of the statues. It was all high spirited and very, very happy. was what is now known as a catchphrase and repeated often throughout the war. prepare them for what was to come. Chamberlain returning from his visit to see Hitler and waving a piece of paper – “Peace in our time”! to have this done and was a great deal of money then. hand pump to keep the baby alive. These things were accepted as part of life. One morning as I was playing in the back yard our neighbour’s daughter called Dad to the fence. a house nearby, also noted by Watneys Road, which crossed near our section of the common. to sit there at night holding an umbrella over my brother and I when it rained. Public shelters were dug all over Mitcham and a few remained, but forgotten, until quite recently. telephone game, or just sit and wait for the raid to finish. tasted fine and it was good to be able to take some home to mother, to supplement the rations. papers and read all about it. When I jumped off my bus I ran to join the scramble, too. walk together along the ditch on the edge of the common for protection. of the factory owners, but the other workers. bomb damage. They also called out as they passed but in no way did you acknowledge them. Later I worked in an office with two or three people much older than me, for I was the office junior. One of the ladies was very nearly deaf. She was a bubbly person with a good sense of humour. remembered, “Oh, yes, we did have a bomb drop next door”! at last and the War be over filled our minds. This was what we had lived for all these years. Then came the Street Party. A group of women in the street formed a committee to organise it. On the actual day trestle tables were set up down the centre of the road and covered with cloths. then for only two people in the whole road owned cars. too fast, even for themselves. Then the noise would stop and the silence they left could be felt. terrible had happened to some poor people somewhere. woman passenger. She had bad news to tell and put her arm around her and led her away crying. This must have been the evening of the day mother and the others avoided the rocket. working. We went to look at the damage in our lunchtime. The devastation was terrible to see. rooms and fireplaces, with personal things hanging up there – remnants of peoples lives. find me remotely interesting and concluded that he was hard up for company! wrong. This was a nightmare to me, as I was hopeless at arithmetic. was good to be out in the air again. function. We did not know this when they were first built. lot of this heavy grey metal, often with screw markings in it. a command of the air raid wardens who patrolled the streets looking for leaks in the blackouts. The news broadcasts always seemed to coincide with mealtimes and particularly at dinner times. had little flags to move following the war’s progress. a blessing if ever there was one. us marvellously with their antics supposedly coming from a flat high up in Broadcasting House. kept us bubbling over with hilarity for days afterwards. of the vicar, servers and choir, proceeded by another server shaking incense liberally everywhere. Lane. I cooked sausages and potatoes over the open fire, followed by stewed plums and custard. of Pollards Hill, each surrounded by its boundary of trees. just as I imagined it would be, even down to the knobs sticking out of it. our garden, across the alley and into the next street. me to go upstairs and see if she was all right. It had gone rather quiet up there, usually ominous. nightgown, dancing among the broken glass in Beech Grove, our dog Taffy with her! down to the gas works in Western Road, where we would be able to buy some coke to tide us over. mention names, but we knew who he meant. He was a fine, upright man, an excellent headmaster. and chairs, which had to be put in the front room. knowing that you had survived the raids. lovely Welsh sheepdog, as a matter of course, knowing no other way of life. been killed in an air raid. like stones along with the earth. Dad once came in with a funny tale about a Home Guard exercise he had seen near Beehive Bridge. a clear indication of where he was! to cash any of my savings stamps, she would tell me off. She has given me a complex for life! mean more than we could ever comprehend to those to whom they were sent. weaved and dived in attack, machine guns spitting. So clearly their engines could be heard. Planes would return home from raids on Germany and do the Victory Roll, turning over and over. This was exhilarating to watch. round that a certain shopkeeper was “expecting something in” and people began congregating. The counters of Woolworths in Mitcham were empty, except for one or two nondescript items. Suddenly, there might be a few combs put out, and you joined the queue. and again, if you were lucky, she would reach down and take an item from “under the counter”. and we were lucky to get them in wartime. upon the wall of the greengrocer’s shop proved that there had been. Tinned fruit was a dream. of Manor Road and ate them from the bag as we walked along. and were the highlight of many a wartime Sunday tea. of red London buses packed with children set off, we knew not where. child she wanted. She chose Jean, which was not a very nice feeling for me. to escape the bombing in the heart of London. Mrs Boniface, so aptly named, was pleasantly surprised at the contents of my white canvas bag. possessed, and sometimes very dirty. I was certainly expected to have a cockney accent. us. Nurse Gaunt gave mother her sole attention, as she could not now visit any of her other patients. was nearly six months old. over all the way from Barking and we walked across the common to visit Dad at the fever hospital. It was called the Wandle Valley Isolation Hospital and was near Goat Green right by the river. to most places then, the library especially. books to borrow, which gave much pleasure to read. given some and we found the orangey drink, which you diluted with water, delicious. purple stuff in a glass of hot water made a lovely drink on a cold winter’s day. but we didn’t buy these. also killed that night. She was one of three sisters left fatherless and their name was White. My sister was born in June 1941 – a war baby. There was a difference of eleven years in our ages. Gaunt, lived just across the road from us. evening a few days later I was in the front room with Dad talking to Mum who was in the big bed. to cry. I was afraid for that airman and what would be done to him when he landed. Boniface was very lenient in what we were allowed to do and the scope she gave us was not abused. wireless always triggered this feeling off. way until I came to the row of small houses where they were. and set each week. This was something unheard of in our lives and we rather envied her. see us. I can remember saying, “Oh, I’ve pricked my finger,” in the most wooden delivery ever! as all the transport had been stopped because of a raid. Mitcham was also changing foster homes and the two of us went there together. cause to want to leave. they were paid for, and gave them to us for Christmas. School itself was hit by a bomb during the war. of mother, which did not surprise me at all. chutney from the tomatoes, as well as pickling the shallots Dad grew. man’s wage was about that amount. The remaining few shillings were put into the firemen’s fund. all recognise the drone of German bombers. Sherwood Park Road and was called “Windy Corner”. ARP Wardens for Pollards Hill area, probably taken near “Windy Corner” main post at the junction of Sherwood Park Road/Chestnut Grove. Note bomb damage at rear. My father .. is standing fifth on the left of the picture. Most of these people were neighbours or known to me. washing machines about then and very few cars needing hosing down. Croydon Road, which was to be used as a secret headquarters if the invasion came. 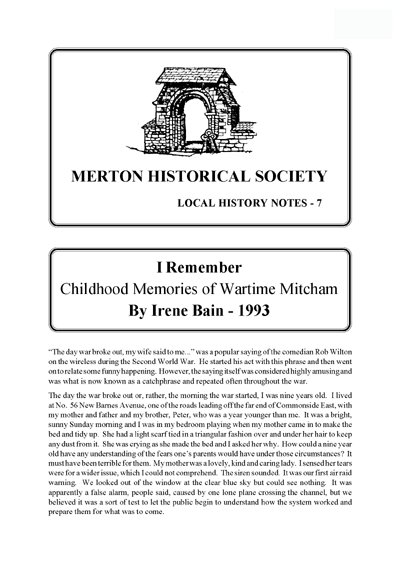 This entry was posted in Publications, Local History Notes and tagged in mitcham, modern mitcham, Reminiscences, wartime.